Let’s See If This Rig Can Float! You know what’s pretty fun to do with your RV? Put it on a boat and float across part of the ocean, of course! 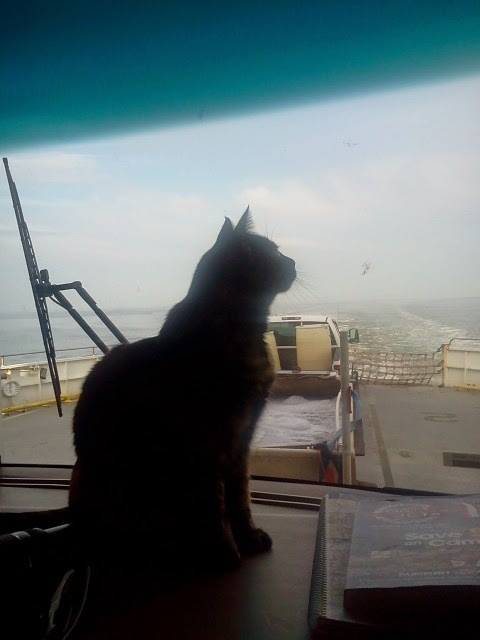 The Mutiny aboard the ferry (hey, there’s Cleo in the window). It totally made sense to utilize the North Carolina ferry system to get back to the east coast as we continued our way south from the Outer Banks. At first we were a little concerned because we would have to time things just right since our trip would actually mean passage on two different ferries, the second being about 2 1/2 hours long. That meant not only getting up and at-em early in the morning but also arriving at our next destination as the sun was setting. We don’t like to do either of those things. But…it would save us a ton of time, mileage and money. After all, covering that distance aboard a boat meant we weren’t burning our own fuel. 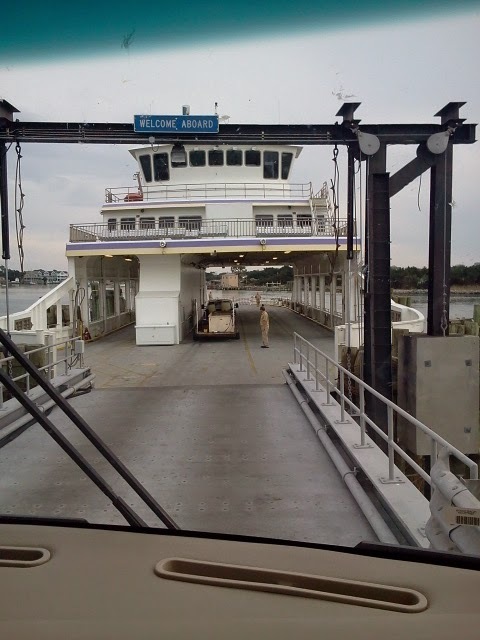 The first leg of the journey was a one hour free ride to Ocracoke Island with a “layover” before the connecting ferry could take us to Cedar Island. 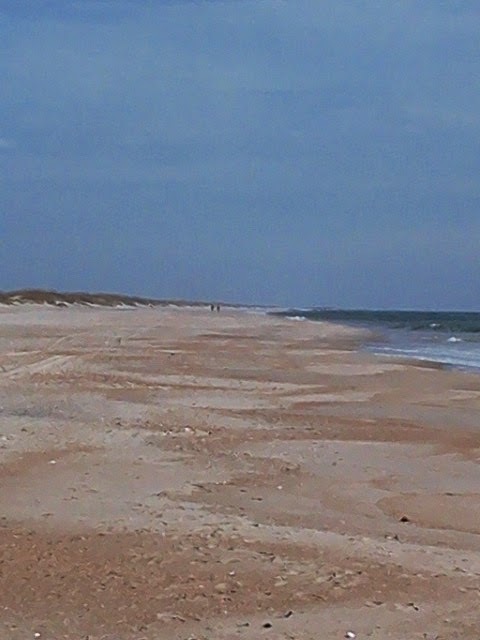 But that was okay because Ocracoke is a pretty nice place to visit. 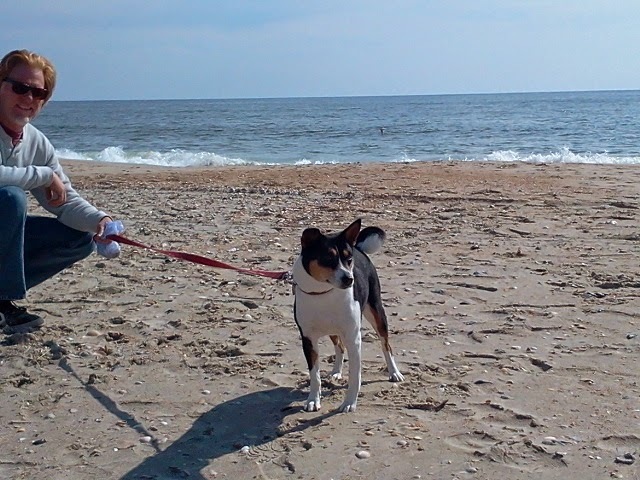 Cleo was not a beach dog but she tolerated that day. It’s also the home of the Banker Ponies. It’s believed that the ponies residing here are descendants of the Spanish mustangs that were left behind (to lighten the load of a ship passing by) back in 1585! . The ponies (which are actually horses) now reside in the confines of a 180 acre pasture which was built by the National Parks Services and keeps them safe from the highway traffic and prevents overgrazing. The park runs an Adopt-a-Pony program which helps care for these magnificent horses (and it’s only $27 a perfect gift for your friends and family)…it’s a cool way to give back and do something nice. One of the Banker Ponies. Gorgeous remote beaches, beautiful wild horses, cold beer, good wine and local oysters?? What’s not to love about this place! 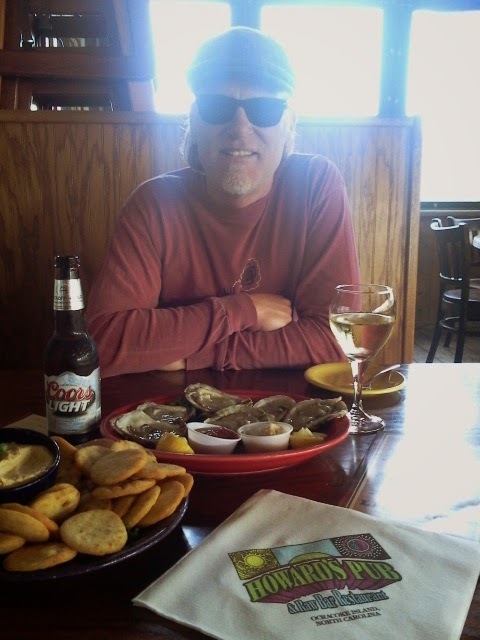 He got the raw oysters…the vegetarian/vegan options for me were pretty much just deep fried vegetables. 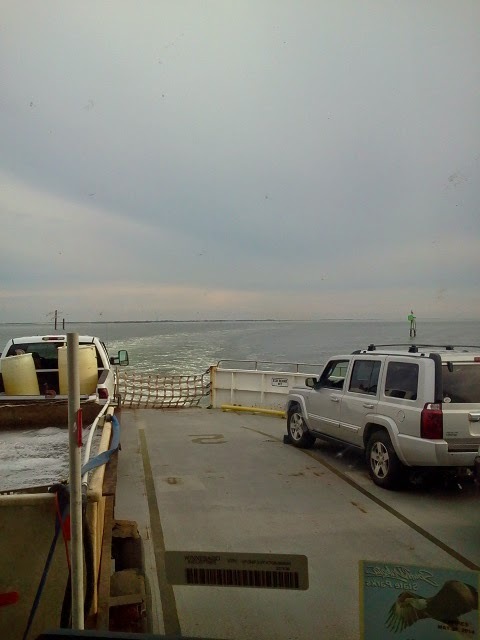 After a nice tour of the island we got in the ferry line and headed to the mainland. As I mentioned, this leg of the journey was about 2 1/2 hours long but since we didn’t have to do the driving it was very relaxing. It cost about $45 for the RV and Jeep together…much cheaper than the gas it would have cost us to drive all the way around, which would also means we would never have seen any of this! It’s a tight fit but the people who work on these things are experts. Trust them…they’ll get you on safe and sound. Avi’s trying to figure out what’s going on. 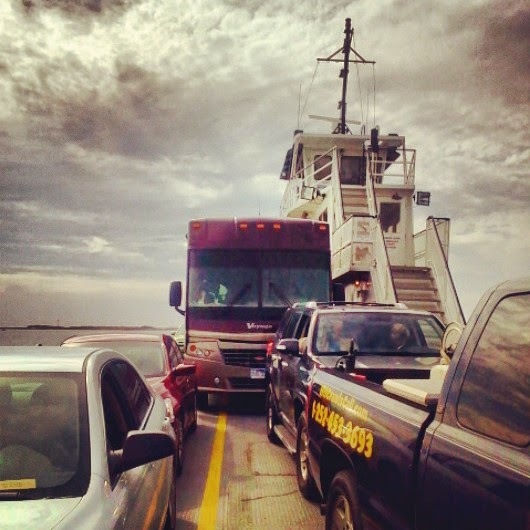 The ferries are all pet friend (in the vehicle or on a leash) but offer no food or beverage service…not that it matters when you have your whole house with you. The ride was smooth and relaxing. I read a little and Clark took a nap. We didn’t spot any dolphins but we did pass by a cool looking boat wreck. After we disembarked we still had an hour drive to the campground where we had reservations. Back then we tended to over plan, making pre-paid reservations well in advance. While this can take some of stress off while traveling it can also be a bit limiting by locking you into a specific destination. If we had to do it all over we would have camped for the night right where the ferry dropped us off since it was already almost dark. Since we had already paid for our stay in Swansboro (non-refundable) we pushed on into the dwindling light. 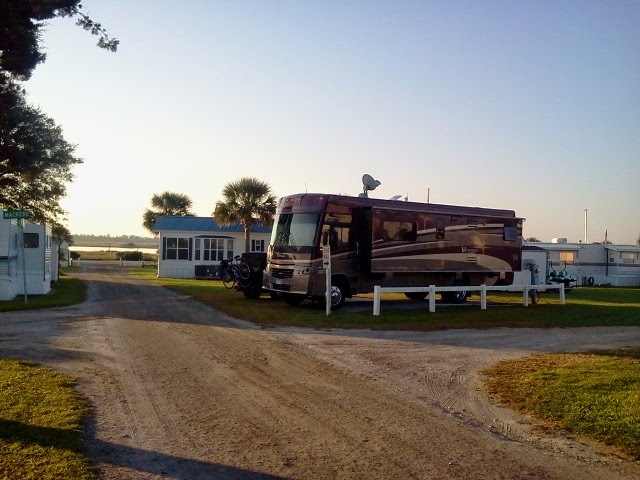 We stayed our one night at Waterway RV Resort in Swansboro, North Carolina. Although it was a Passport America campground (and Thousand Trails) it still was about $35 for the night. Their regular price is $69 so I suppose it was a deal. But since we arrived after dark and had to leave by 10 am we never got to enjoy the many amenities the website boasts. I don’t feel comfortable giving a full review of this place since we only stayed a few hours (so it seemed) but I did notice that our overnight spot was right among permanent residents (including mobile homes). We were the ONLY RV in this section. 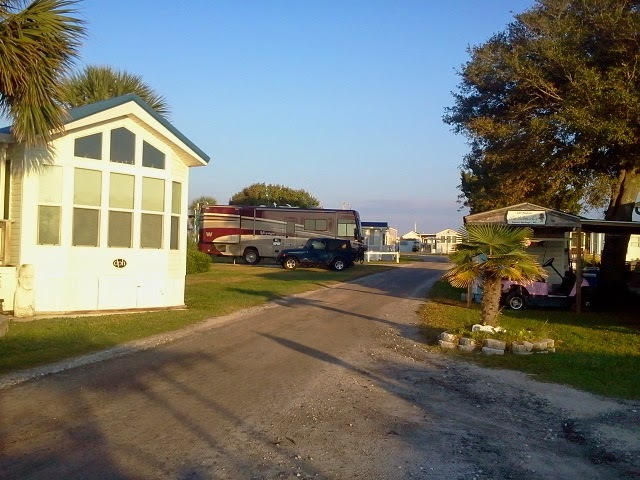 A well maintained “campground” with mostly mobile homes. Even though our stay at Waterway lacked anything worthy of reporting, the ferry rides and layover on Ocracoke were waaaayyyyy worth it. It’s a fun way to see that part of the country and an experience I’d do over again in a heartbeat. We stayed around Swansboro for a month. It was going to be a couple of weeks, but the campground had a monthly rate of $385, so we took advantage of it. Brandon dove out of Morehead City, we caught up on work, we saw the ponies in Shakleford Banks, and we drove to Raleigh to avoid a hurricane. Good times. Although I don't think you need a month theWe stayed around Swansboro for a month. It was going to be a couple of weeks, but the campground had a monthly rate of $385, so we took advantage of it. Brandon dove out of Morehead City, we caught up on work, we saw the ponies in Shakleford Banks, and we drove to Raleigh to avoid a hurricane. Good times. Although I don't think you need a month there, it was a nice place to visit. 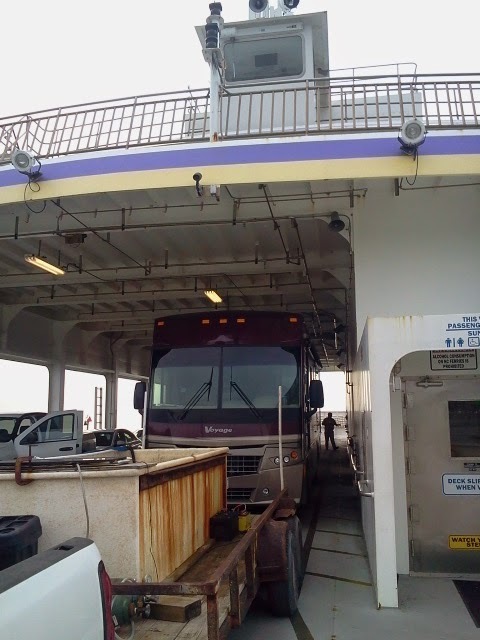 We didn't do the ferry and RV or the upper Outer Banks, so it looks as though we'll head back sometime. The Outer Banks is beautiful. If and when we find ourselves on the East Coast again I'd definitely go back.